Printed items include one color / one location imprint. Screen charge(s) may apply. Need help? View the Artwork Instructions. DO NOT EMAIL ARTWORK. You can upload artwork here or via our Automated Proof System (APS). You will receive a FREE artwork proof. Check your email. Make sure DiscountFavors.com isn't being filtered. Use basic punctuation. Do not use carriage returns in notes. Upload files with simple, text only file names. Max Splits: 4 Item Colors. Imprint Dimension: 0.37"H X 1.25"W.
Price Includes: One Color Imprint. Yes, samples are available for every item on our website. The price of the sample varies between items. Select the 'Sample' option in the Style drop down menu next to each item and the cost will appear in the Item Summary box to the right. You may choose the color of the sample you wish to receive but we can not guarantee the color of the imprint. All samples will come with a random logo to demonstrate the quality of our printing. + Can I have more than one imprint color? No, our items are one color imprint only. 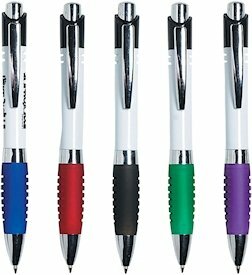 The only items available with an option for multiple colors is our Full Color items. + Does it cost more to have double sided artwork? No, it does not. As long as the item has the option to have artwork on both the front and back, you may have double sided artwork and the price will remain the same. You are also able to have different artworks on each side without any addition to your cost. + Can I have less than the minimum quantity shown? No, each item has it's own minimum quantity. The minimum quantity is based on the case quantities of the item and can not be adjusted. + What is the turnaround time on orders? Turnaround times vary on each specific item. Like everything, some things take longer to make than others. The item summary box shown next to each item states the 'Processing' time for art, production and transit time on each order. Delivery dates are also shown in this section. If quicker turnaround is needed, you are able to adjust either the 'Production' time or shipping method drop down menus. + When do I receive my artwork proof? All proofs are sent within 24 hours after your order has been placed. Once you have received your proof, we recommend approving artwork within two business days after order was placed to ensure your original delivery date. If changes need to be made, please keep them to a minimum as to not delay order process. + Can changes be made after I have approved my proof? Once artwork has been approved, it is quickly sent into the production que. Any and all changes must be made before approval in order to guarantee that the change can and will be made. If changes are absolutely necessary and order has not yet been printed, some exceptions can be made but fees may be applied depending the item and if screen has already been made. + When will my order ship? All orders are shipped out according to the delivery date given when the order is placed. If an order is approved and printed quicker than expected, it is possible that order may ship out earlier than originally scheduled. If so, order may be in hands before your delivery date but please keep in mind, we can not guarantee any delivery date sooner than what was first promised to you on website and confirmation email. + What is the cancellation policy? All cancellations must be done before artwork has been approved. There is no penalty fee for early cancellations, you will receive a full refund and a credit memo confirmation via email. If order has yet to print but a screen has been made, fees may apply.